Comparing 'The night of the scorpion' and 'Digging'. 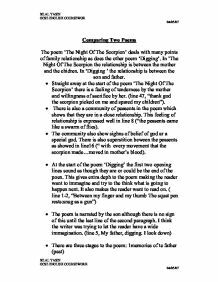 Comparing Two Poems The poem 'The Night Of The Scorpion' deals with many points of family relationship as does the other poem 'Digging'. In 'The Night Of The Scorpion the relationship is between the mother and the chidren. In 'Digging ' the relationship is between the son and father. * Straight away at the start of the poem 'The Night Of The Scorpion' there is a feeling of tenderness by the mother and willingness of sacrifice by her. (line 47, "thank god the scorpion picked on me and spared my children"). * There is also a community of peasents in the poem which shows that they are in a close relationship. ...read more. * The poem is narrated by the son although there is no sign of this until the last line of the second paragraph. I think the writer was trying to let the reader have a wide immagination. (line 5, My father, digging. I look down) * There are three stages to the poem: 1memories of te father (past) 2 memories of grand father (further past) 3 the present. This is a leap in the tense fron past to present.+ * The ending of the poem is similar to the first with some minor alterations. (line 29- 31, " Between my finger and my thumb The squat pen rests. ...read more. (line 2 'snug as a gun') this phrase showa how the squat pen rests very comfterble like a gun in a hand is ergonomic. * There is some boasting added in to emphise the feeling of the young boy and the way he feels terwards hs father and grand father. (line 17 -18, "My grandfather cut more turf in a day Than any other man on Toner's bog. * Repititon in the poem is used to emphisise the point. ( line 23, "going down and dowm") * Quick sentence structure gives impressions of character movin fast. Reflection: I found this work quite hard as In that I thought a bit more background info and a basic outline of how to set it out would have come in handy. 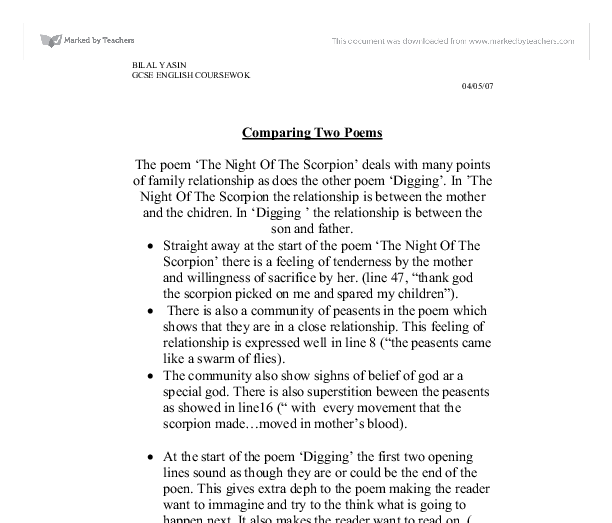 BILAL YASIN GCSE ENGLISH COURSEWOK 04/05/07 BILAL YASIN GCSE ENGLISH COURSEWORK 04/05/07 ...read more.